If a white person orders their Starbucks Coffee with sugar and cream, does that make them a racist? I love how the left always accuses conservatives of throwing their values in everybody's face even though they never do. It's usually the other way around. At every conceivable turn, liberals hop onto to their lopsided soap box and try to browbeat everybody into submission in order for them to embrace what they support such as global warming or gay marriage. These people in their warped, self illusion minds have crowned themselves as being the only views that are suppose to matter in society and we all must conform or else. As for me, I just laugh in their face with amusement. I remember when the left was fit to be tied over the views of the founders of Chic-Fil-A in regards to their position in supporting traditional marriage. The company itself didn't have a position on gay marriage it was the founders and their family. Chic-Fil-A didn't support traditional marriage as apart of it's business.They didn't use their business to try and advance their social beliefs. Now lets talk Starbucks Coffee shops or as I like to call them "$tarsmucks" on the other hand. The CEO of $tarsmucks Howard Schultz is a radical liberal. As CEO of $tarsmucks, he has blurred the lines between what are his personal beliefs and what are proper business practices. 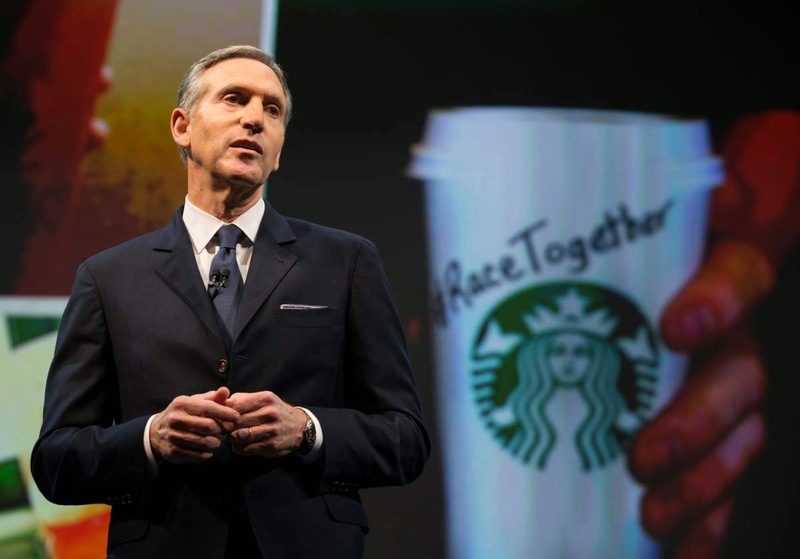 For example, $tarsmucks launched a social something last week asking their baristas to engage their customers on the issue of "race and racism"
I'm pretty much an expert at calling out people's hypocrisy, and I wish I could ask Howard Schultz some questions about racism and race and $tarsmucks. The blood of two police officers shot in front of the Ferguson Police Department rest solely on his hands. Officer Wilson was cleared in their own probe and no charges were brought! 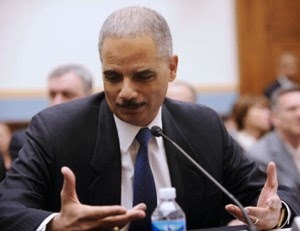 "Why did Eric Holder feel it was necessary to conduct an investigation into the Ferguson Police Department" when his own Justice Department's investigation into the Saint Michael shooting found no racial attributes regarding the shooting"? People in Ferguson got all racially ginned up again based on the report that was released by Eric Holder's Justice Department into the Ferguson Police Department in which they claim the department had deep seeded racial issues that needed to be addressed. As for those issues. The investigation turned up TWO racist emails that were sent several years ago by Ferguson Police Officers. From how the Justice Department report described the report, one would think that David Duke's brother was running the place, but that wasn't the case. Most of the people who were fired over this JD's report were members of the Ferguson City Government and NOT the Ferguson Police Department.!! So because of this highly publicized report which didn't show any wide spread systemic racial issues with in the FPD but was presented as if it did, black protesters got emotionally worked up into a frenzy and decided to protest outside the Ferguson Police Department and one of those protesters based on that report decided he was going to try and kill some Ferguson Police Officers. That's pretty much sums it up. The ironic aspect in this shooting is that the two officers who were shot weren't even Ferguson Police Officers. One officer was from Saint Louis County and the other was from the Webster Grove Police Department, but I suppose that doesn't matter much to those who "think" with blinded rage, a cop is a cop and cops deserve to be shot according to their mindset. Eric Holder is s suppose to be the nations top cop as the Attorney General, but I truly have to wonder who's side is he really on. More often then not, he seems to be on the side of the very protesters who are targeting the police officers across the country. The Ferguson Police Chief had to become a scrafical lamb for the blood thirsty mob and was forced to resign, even though he didn't have anything to do with the death of Saint Michael Brown. I guess that's social justice on display.The Perception of addressing the problem is more important then actually addressing it I suppose. Were the remakrs by Dr Carson a potential 2016 death blow? If so then why? Looks like Dr Ben Carson has had a rough week. For the life of me, I can't really figure out why this big firestorm has errupted. I mean his comments he made on CNN about believing that homosexuality is a choice based on how straight men go to prison and come out gay was his opinion. I don't really see where the "great controversy is in what he said? People on both the left and sadly even the right are attacking him, but was what he said factually inaccurate? The 2016 Presidential campaign season has just begun, yet some are saying that Dr Carson has already ruined his chances to try and win the GOP nomination. Surprisingly some on the right are saying the same thing but why? Sometimes conservatives have a tendency to inflict dumb dumb wounds on themselves. They always wonder how the GOP establishment candidates always seem to win the nomination for the presidency, it's really simple. They stick by their candidates no matter what. With conservatives, it's hee woo throw them overboard at the slightest misstep. With Carson's comment, there really wasn't even a misstep. When Jeb Bush wins the GOP nomination, you'll know how it happened.